Traditionally, Awori are found in Ogun State and Lagos State, Nigeria. The Awori people migrated from Ile Ife and occupy present day Lagos state, with a considerable section of the Awori clan occupying areas within Ogun State as a direct fall out of the creation of Ogun State in 1976. Towns including Isheri, Ota, Igbesa, Ilobi, Tigbo are all Awori settlements within today's Ogun State in Nigeria. The settlement of the Awori clan preceded the establishment of Abeokuta as an Egba kingdom in 1832, as Isheri, the foremost Awori town within present day Ogun State was settled in the 15th century. The Awori are direct descendants of Olofin, one of the sons of Oduduwa - the father of the yoruba nation. As such, in accordance with Yoruba custom, they brought their crown along with them from Ile Ife. Osolo, one of the sons of Prince Olofin, settled at the Osi quarters as his father and his brother journeyed further south from the place where the plate sank at Idumota. 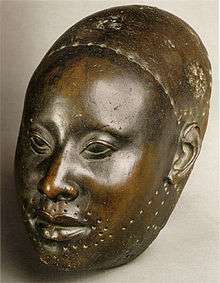 The first crowned Oba at Ota was Oba Akinsewa Ogbolu in 1621, he was the son of Osolo. Olofin and his followers left the palace of King Oduduwa in Ile-Ife and migrated southward along a river. Oduduwa had given Olofin a mud plate and instructed him to place it on the water and follow it until it sank into the river. The plate is said to have stopped at various locations and finally sank at Idumota in the present day Lagos State in Nigeria. As they were to settle wherever it sank, the people were filled with joy when this finally happened. The name AWORI, which translates as "The plate sank", became the name by which the clan is known till today. Several days after leaving Ile-Ife, the plate suddenly stopped near Olokemeji near present-day Abeokuta. After seventeen days, it began moving again, only to stop at Oke-Ata for another seventeen days. At the end of seventeen days, the plate began moving again, only to stop again on the southern outskirts of present-day Abeokuta, where it stayed for another seventeen days. At this location, some of Olofin's followers decided to remain, led by a man named Osho Aro-bi-ologbo-egan. The plate continued downriver, stopping again at Isheri, where it remained for a much longer period of time. Olofin began instructing his followers to begin setting up a permanent settlement, but after 289 days (17 x 17) the plate began moving again. Olofin and a few followers followed the plate, while the rest of the group stayed behind. After two days the plate stopped briefly at Iddo in Lagos. At Idumota in central Lagos, it whirled around in the water and sank to the bottom. When Olofin returned to his group at Iddo, they are said to have asked him where the plate was. He answered "Awo Ti Ri" meaning "The plate has sunk". This is how the name Awori is said to have come into being. The Aworis are thought to be a peace-loving, accommodating and friendly clan. ↑ E. A. Ajayi; R. O. Ajetunmobi; Akindele S. A. (1998). A History of the Awori of Lagos State. Adeniran Ogunsanya College of Education. ISBN 978-978-142-035-1. ↑ Jeremy Seymour Eades (1980). The Yoruba Today. Cambridge University Press Archive. p. 16. ISBN 978-0-521-22656-1. ↑ Margaret Peil (1991). Lagos: the city is the people (World cities series). G.K. Hall. p. 5. ISBN 978-0-8161-7299-3. ↑ Ota Biography of the foremost Awori Town. ↑ Ruhollah Ajibola Salako (1999). Ota: The Biography of the Foremost Awori Town. Penink & Co. pp. 13–14.